Political parties including Naam Thamizhar Iyakkam, Viduthalai Chiruththaikal Kadchchi and supporters of the people of Tamil Eelam burnt the effigy of Sri Lanka president Mahinda Rajapaksa in several places in Tamil Nadu Thursday protesting against Indian government for having invited Mahinda Rajapaksa as an Honoured Guest on the final day of the Commonwealth Games 2010 in New Delhi, sources in Chennai said. The protestors carried out their demonstration defying the ban on the demonstration imposed by Tamil Nadu police. Vaiko, the leader of Marumalarchi Dravida Munnetra Kazhagam (MDMK) vehemently condemned Prime Minister Manmohan Singh and Sonia Gandhi for having invited Mahinda Rajapaksa in the demonstration in Koavai. Vaiko said that their decision had hurt the sentiments of millions of Tamils in the light of what Mahinda Rajapaksa had done to their brethren in Sri Lanka in the name of eliminating Liberation Tigers, the sources added. 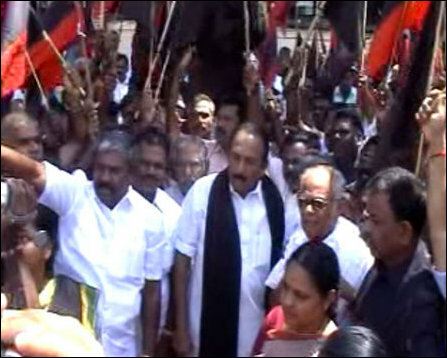 Vaiko and his supporters who defied the police ban were arrested Thursday and later released in the evening. Supporters of Viduthalai Chiruththaika’l Kadchchi burnt the effigy of Mahinda Rajapaksa at the entrance of the Sri Lanka Deputy High Commission in Chennai. Law students in the cities in Tamil Nadu including Chennai, Koavai, Thiruchchi, Mathurai and Nellai burnt the effigy of Mahinda Rajapaksa defying the police ban. Some activists of Hindu Makkal Kadchchi led by its president, Arjun Sampath were also taken in custody, for supporting the MDMK's agitation.